Payette Forward’s mission is to help people solve problems with their technology and communicate useful information using language that everyone can understand. Since its inception in 2013, Payette Forward has evolved from a small startup into a trusted provider of the highest-quality information for people searching for solutions to problems with their iPhones, Macs, and other technology. 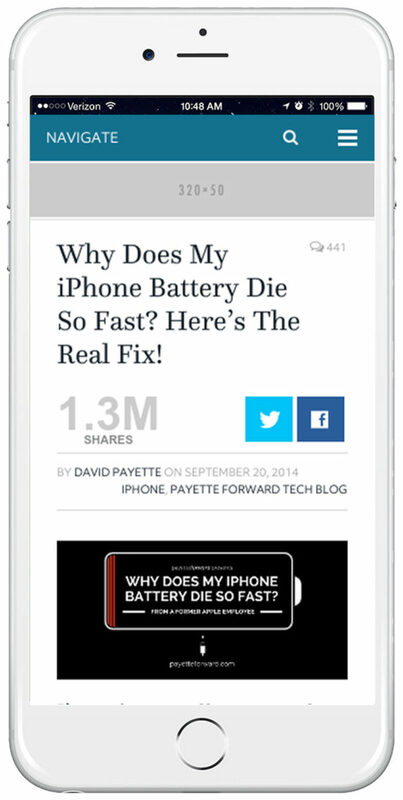 During the first week of February 2014, over 5 million people visited Payette Forward’s website after the article called “Why Does My iPhone Battery Die So Fast?” went viral on Facebook. A few months later, it happened again. Founder David Payette is a former Apple employee who has had extensive experience with the diagnosis and repair of hundreds of Apple products. Through one-on-one computer lessons and Genius Bar appointments, David’s first-hand experience with actual product owners led to a singular combination of technical expertise and the ability to translate industry jargon into everyday language. Again and again, Payette Forward readers find solutions to their problems and leave glowing reviews about how relieved they were to find an article that even they could understand. Payette Forward offers opportunities to reach a targeted audience of high-end technology users. To learn more, contact Alex Sakolish, Marketing Coordinator for Payette Forward, or visit Advertise on Payette Forward to download our latest media kit and discover how a strategic partnership with Payette Forward can work for you.